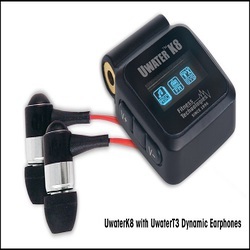 UwaterK8 - "World's Smallest and Smartest 100% Waterproof Swim MP3/ FM Radio"
"The World's Smallest and Smartest MP3 IPOD & Radio"
This micro-sized entertainer, the world's smallest & smartest, clips onto swim goggles or fastens onto headband, armband, swimsuit or belt for swim anywhere, go-anywhere listening pleasure. At merely 1 Ounce, you won't even notice it's there! This NEW 5th generation Action Player combines the features of the G4, G5, and the K7 plus enhanced capacity and features. With 8GB of memory, you can easily create personal playlists of 2,400 songs or 20 audio books with up to 99 sub-directories and up to 8 hrs of playtime. Uniquely engineered double-molded PVC case, soft touch TPL controls, Stainless Steel back plate (adopted from Swiss watch makers) are 100% waterproof. 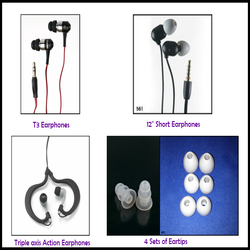 Ergonomically-designed extra-soft ear tips seal water and sweat out and keep pure stereo sound in. 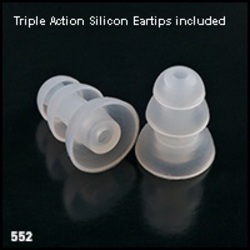 Our triple-action silicon ear tips are also included. End forever the boredom of lap swimming or just enjoy the novelty of hearing music, audio books, talk, sports, news, in the water, on the beach, while surfing, skiing, sailing, showering, outdoors walking, running, any activity! In addition to 8GB MP3 Player, the UWaterK8 sports a digital PLL FM tuner with superb reception indoors & outdoors worldwide, plus a special format for Audio Books. 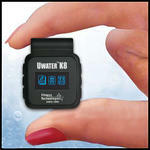 We also installed a bright high-resolution 27 mm OLED display for easy navigation in any water environment. 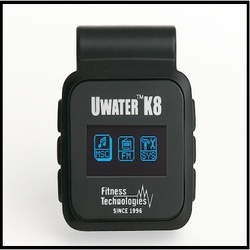 Fitness Technologies Inc. has been the USA#1 provider of waterproof electronics since 1996. 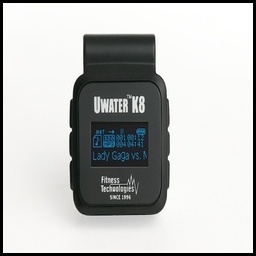 Our Waterproof Audio Technologies (WAT) were featured in US News & World Report, USA Today, New York Times, LA Times, Men?s Health (Europe), Swim World, Fitness Swimmer, Triathlete Magazine, CBS, NBC, CNET TV, and were also top rated after testing by Swimmer Magazine, the official publication of US Master Swimming. Developed in the USA. Patents Pending. June 2017 Update: Product is under engineering upgrade thus temporarily unavailable. 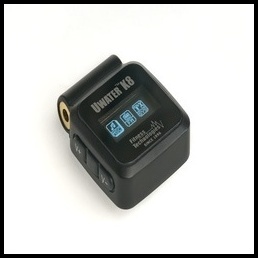 Please consider the G8 or the Action iPod Shuffle + K7 for complete audio experience! NOV/2016 Update: Product is currently under Engineering Upgrade. Please confirm availability. Play Time: 8 HRS on a single quick charge! High Resolution OLED Display with adjustable backlight. Seven (7) PLAY options: Normal/Random/Intro/Repeat/Repeat One/AB Folder/Replay All. Up to 99 sub-files (sub-directories). Digital FM tuning (manual,auto, 20 stations store/recall).